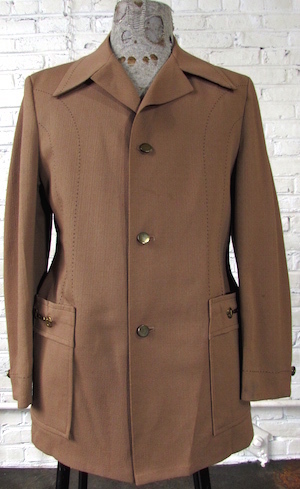 Home > Vintage Suits & Blazers > Suits / Blazers 1970's > (36, Short) Mens Vintage 70s Leisure Jacket! Toffee Brown with Dark Brown Top Stitching! Mens Vintage 1970s Leisure Jacket! Awesome textured double knit polyester leisure jacket in toffee (medium / light brown ) brown with dark brown top stitching at the collar, cuffs and going down the chest. 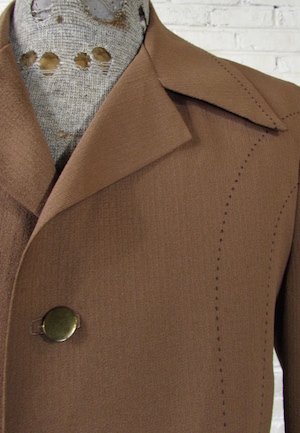 Super wide 70s disco lapels, three brass toned (have some patina distressing on them, looks kind of cool) buttons in the front with matching buttons on cuffs. 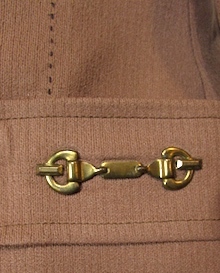 Two pockets with brass toned pimperrific accents on the front. Fully lined in a cream colored acetate. Tagged American Craftsman. Made in the U.S.A. Condition: Very Good. Small brown stain on the back of the left sleeve. Still a super funky blazer!.